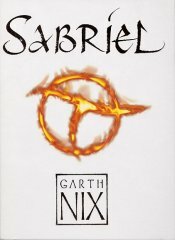 In Sabriel's world there is a wall which stretches from coast to coast and which protects Ancelstierre in the south from the Old Kingdom in the north. There is a crossing point in the wall into the Old Kingdom, though it is heavily guarded, and still magic seeps across into Ancelstierre. What kind of magic? Charter magic. And uncontrolled Free Magic. There are other crossing points too. For instance, sometimes the Dead cross back into Life. And Sabriel can pass from Life into Death, for she is an Abhorsen. She opened the sack and reached inside. A sword hilt met her grasp, so she drew it out, still scabbarded, and put it to one side. She didn't need to draw it to see the Charter symbols etched along its blade - the dull emerald in the pommel and the worn bronze-plated cross-guard were as familiar to her as the school's uninspired cutlery. It was Abhorsen's sword. The leather bandoleer she drew out next was an old brown belt, a hands-breadth wide, which always smelled faintly of beeswax. Seven tubular leather pouches hung from it, starting with one the size of a small pill bottle; growing larger, till the seventh was almost the size of a jar. The bandoleer was designed to be worn across the chest, with the pouches hanging down. Sabriel opened the smallest and pulled out a tiny silver bell, with a dark, deeply-polished mahogany handle. She held it gently, but the clapper still swung slightly and the bell made a high, sweet note that somehow lingered in the mind, even after the sound was gone. "Father's instruments", whispered Sabriel. "The tools of a necromancer." It's a bigger task than she reckoned though. This is a brilliant story full of superior magic, high drama and moments of humour. It goes straight into my list of Ten Best Books Ever. Earnestly recommended!